Technology offering consistent performance throughout the tire's life. Good quality. Better than average tread life, Good wet traction performance, Good value. I just put these tires on my Bike four days ago and have had the chance to put them on a good trip from Colorado to Nevada and back. The weather was not a bikers dream. I had extreme winds both ways from head on to side to side. This front tire stayed glued to the road in rain wind sand storms. I won't ever put the stock Harley Dunlap tires on my bike again. Always ran these on my Street Glide, now I've got a Road Glide and once ive gotten my usual 7000 miles out of the dunlops I'll be changing them over to the metzlers. I like the feel of these tires on the road wet or dry. I ran then a few pounds low and the tread just wore away very fast. Talked with a teck at the Goldwing meet in 2016 tool me to run a pound or two over bike chart.that should help, 6000 showed heavy ware at 8000 was done. I don't know if it was the condition that I left my old tires (OEM) but these Metzeler's seem much more sure-footed and responsive. I don't know what the tread life will be like as they have only been on the bike a month now and winter is coming, but I do like how they feel. They handle corners and bends unbelievably compared to OEM tires. The ride is so much smoother, and I don't find road snake tracking to be an issue any longer. They handled just fine in the 10 miles of drizzle that I rode through, though I kept the speed to around 50mph. These were mounted for a Utah to Alaska round trip. That trip was 3 years ago and they are still going with over 14k on the clock. I pulled a small trailer that was well loaded. They worked fine on street, gravel and at times mud! Great value for the money. Not my first set of metzelers and deffinatly not my last! Great riding tires They made a major difference in the ride of the bike. More control of the bike, better cornering. I bought these tires looking for high mileage. They run great and handle the tar snakes pretty good. Hopefully they will give me the high mileage that I am looking for. Only tires I have put on my 2006 Vulcan 2000 Classic LT. Always get great wear and handling, cant beat them for the price! Metzler 888 Marathon for Harley touring bike. I am on my second set of 888. I like the way they perform on wet and dry pavement. I ran Dunlops for years, but I have switched to these from now on. I got about 8,000 miles out of rear and should double that for front. I'v been running Metzler tires now for the 6yrs or so. I generally ride 16,000-20,000 miles a year so I go through a set about once a year. I like the way the ride and I like the way the handle in all road conditions. Great tires !!! I install tires not only on my motorcycles, but for friends also. 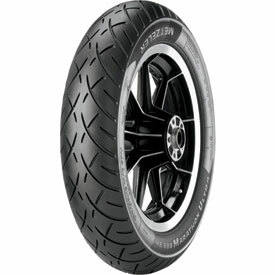 I don't recommend tires unless asked, given that, I asked all the time and time after time, I recommend Metzeler tires. My personal experience, combined with 5 Harleys from 3 different classes of bikes, makes Metzeler the best choice overall for me.There's not another tire made that compares in value, tread life, traction and handling for my needs. I run Metzeler, front & rear on all 5 of my bikes and since using them, I have collectively ridden over 500,000 miles with no issues. 2007 Ultra Classic. The first tire had a bad shake. The Second was fine. great mileage and handling. it is noisy on some roads. Installed this tire on the front of my bike and have had no issues. Haven't ran into much rain but the little I did encounter I had no problem with grip. I feel comfortable going into corners and it doesn't tend to follow the stupid road grooves as bad as the stock tires did. Can't say much for tread life yet but it seems to be holding up. Great tires handle very well will see how they wear. I don't have many miles on the tire yet but I am very happy with the dry weather handling of it, I'm sure I'll be just as pleased with it on wet roads. When the time comes I will be looking at the 888's for a new rear tire. Bought these tires for my bike and have been very happy with them. I bought them just before I took a 2000 mile ride. During the ride I hit water, snow, and dry pavement and was very happy with the performance. They grip great and still look brand new. I would recommend them! if 42 psi is max what should every day riding psi be set at? BEST ANSWER: Depends on load and speed you will be running, Riding single, double or pulling a trailer requires different pressure. Your first point of reference should be your motorcycle's owner's manual. The max rating on the side of the tire is simply that... the max rating of the tire. However, some manufacturers will suggest a low pressure to improve ride, which doesn't necessarily mean the best wear or handling. I suggest you start at your motorcycle manu's pressure, then vary a little 'till you find the handling you like the best. As an example: my Nomad's manual says 28psi for the front. Waayyy too soft for good handling, though it gives a smoother ride. I run mine at 36psi for the best handling and wear. The recommended tire pressures should be in the Owners Manual for the motorcycle (or find the specifications on line). It might also be on a sticker on the motorcycle itself. I run between 28 - 30 psig. Always Check and verify what the Manufacturer's specs are for each specific vehicle/application. You can't go wrong there! run a pound or two over bike specks as for a Metzeler teck... I love the tire ride and feel but be aware as a short mileage life. I am running this ob a heavy touring bike. A 97 Valkyrie. Riding single I run 28-30 psig. Riding Double I run 30 -32 psig. Load, towing, weight, shocks or forks loaded with air. Outside temp. so many variables to give a one time answer. 40 psi is what you should use for everyday riding & checking air pressure monthly.